Everyone's decision to adopt a vegan lifestyle may not be the same. Some come to veganism because of health concerns and find that a plant-based diet can reverse, as well as prevent disease. Environmentalists realize that animal agriculture is creating the bulk of global warming and that without change, our survival on this earth will not be assured (yes, it’s that serious.) And then there are some who have come to understand that the immense cruelty imparted on billions of animals is detrimental to personal peace on any level. As a vegan coach, I'm committed to helping others understand the concept of veganism. The healing benefits and spiritual elements to this transition are life-changing. I start where you are. What is your time worth? ...and what is your health worth? 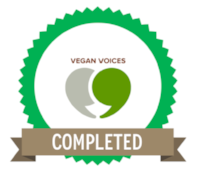 As a master-certified vegan lifestyle coach and educator, my first task is to listen and understand the reasons you may want to learn about veganism and plant-based living. I'll guide you through a process that will make the transition stress-free and exhilarating. All the information you need, directed by a caring professional who genuinely wants the best for you. And I'll take out all of the confusion. it would've been so much easier! I've already done the research, I know the substitutions, I've got the killer recipes, the shopping lists and the important nutritional information that makes the whole process easy. A vegan coach can help you understand how to transition to a plant-based diet in a healthful way – with correct nutritional requirements and supplementation, so that you can feel full, satisfied and really good about yourself. You'll be healing your body, helping to save the planet, and elevating your compassion to new heights. My vegan coaching sessions are customized for you. Coaching sessions are 60 minutes long - with email follow up. This includes emails, updates and enough communication to help guide you through. Your first 20-minute coaching consultation is FREE! In Karuna Kitchen, we learn to make plant-based meals that are outrageously delicious. and a few new recipes, too. New Classes (including online) Announcing Soon!! Subscribe to get the dates & details. YES…I WANT THE NEW CLASS INFORMATION AND RECIPES TOO! Do you recognize the value of incorporating plant-based options & vegan information into your business model & bottom line? It definitely takes forward thinking. Marketing to the Vegan Community, Implementing Plant-Based Education into the Workplace & other creative opportunities. 'How Veganism Heals' has been presented to groups at the Mid-Hudson Regional Hospital, Dutchess Community College, The Omega Institute Staff Program, The Fountains at Millbrook as well as various regional groups & organizations throughout the Hudson Valley. I attended the lecture at Mid-Hudson Regional Health Center Wednesday on March 23rd, and I was very impressed with your professionalism and compelling delivery. Your were smooth, experienced, and you delivered your talk with deliberate natural pauses, and allowed the words and the meaning of your thoughts to sink in, and be absorbed, and then you moved on to the next important point. Your persuasive speech skills are extremely high! I was so impressed, that immediately after the lecture ended, I drove to Adams Fairacre Farms on Route 44 in Poughkeepsie, and I purchased two pints of “So Delicious” brand coconut milk frozen dessert (non dairy ice cream). In my life I have had brief periods of this philosophy with no regrets or lacking, so the idea of changing my food intake is a possibility, given your motivation. Your talk was worth listening to, and worth considering for changing my behavior. OH YEAH…I WANT NEW RECIPES, HEALTH TIPS AND LIFE HACKS! SIGN ME UP!